John Abraham is one of Bollywood's hottest actors and even had a chance to come to Oscars 2007. John is from BSS and its creditable that he did so well without any filmi background. John Abraham rose to popularity after winning the 99 Gladrags Mega Model contest. The rest of the text below is taken from Wikipedia. 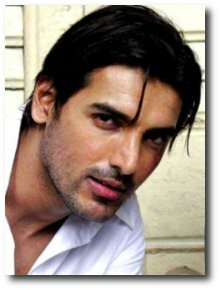 John Abraham born December 17, 1973 is a former model turned Bollywood actor. He currently lives in Mumbai, India. Abraham's father is a Malayali Saint Thomas Christian architect, from Aluva, Kerala while his mother Phiroza Irani is part of Mumbai's Irani community. Irani are descended from Iranian Zoroastrians who migrated to Mumbai in the late 19th and early 20th century. John sometimes describes himself as part-Irani and sometimes as part-Iranian. Abraham's parents eloped; they were estranged from their respective parents until the birth of their first child, John. He was originally named Farhan, but his father gave him the name John, and he has used that name ever since. He has one younger brother, Alan. Abraham attended Bombay Scottish School and later Jai Hind College. He was an avid sportsman, captaining the college football team. He later earned an MBA degree from MET. Abraham started his career with a media firm Called Time & Space Media Entertainment Promotions Ltd., which however closed down due to financial problems. Later he worked for Enterprises-Nexus as a media planner. In 1999, he, won the Gladrags Manhunt Contest and went to Singapore for Manhunt International, where he won second place. Following this, he appeared in a number of commercial advertisements. In 2003, Abraham made his Bollywood debut with the controversial movie Jism at the age of thirty. He has appeared in a number of successful movies since then which include Dhoom (2004), Garam Masala (2005) and Taxi No 9211 (2006). In 2004, John ignored angry threats and agreed to play the lead role in the controversial film Water, which deals with the sad fate of Indian widows in traditional Indian society. The film was written and directed by independent film-maker Deepa Mehta. It had a rocky history; a first attempt to film it foundered, when sets in Varanasi were burned by an angry crowd. John signed for the director's second attempt to make the film, this time in Sri Lanka. The film has been popular overseas and has exposed John to a much wider audience.This film has been nominated for an Oscar in the Best foreign film category. His recently released films are: Baabul, Kabul Express, and Salaam E Ishq: A Tribute To Love. Abraham is currently engaged with fellow model Bipasha Basu. He is a supporter of animal rights. He has even been featured in advertisements for PETA. 2006 Kabhi Alvida Naa Kehna DJ Special Appearance in song Where's the party tonight?